The Avantco W800 11 qt. stainless steel countertop warmer boasts 800W of power to provide fast, even heating that is certain to get the best out of your most delicious soups, stews, or sauces! Excellent for use in buffets, concession stands, cafeterias and more, this countertop warmer has a thermostatic control with 6 heat settings to give you excellent control over the unit's operating temperature. A stainless steel housing and interior lining give this unit a sleek appearance and help ensure consistent, long-lasting performance, while an 11 qt. stainless steel inset is also included for added convenience. The dishwasher-safe inset features a reliable hinged cover that helps retain heat and allows for easy product access without the possibility of misplacement. And, since the cover is notched, it accommodates a ladle for convenient storage. This product was very cheap, and thus very attractive for our small business. However, they have below industry standard warranties, at only 6 months, and of the three soup warmers from Avantco that we've purchased, all failed in a matter of months. The ones that failed within the warranty were replaced by ones that failed as well. Webstaurant has excellent customer service, but Avantco was rude over the phone and dismissive of my concerns over the short life expectancy of their products. If you use a soup warmer frequently, or want a soup warmer that will last you at least a year, do not buy Avantco brand products. We appreciate your review! If you are looking for a different product that will better suit your needs, please contact our Customer Solutions team. Ive used higher end brands and as with my 7 quart warmer I was shocked as to how hot these get. Avantco really is a value for the price and quality. Ive only had a year or so but the Nemco I had in the past didn't make it that long one time. Nice enough soup pot except the weld that holds the hinge on the lid is very poor, it separated within a week of not very heavy use. I am in Alaska and am not going to try to warranty it, will probably ask a local welder to tack it. Going to upgrade for the other 3 Pots I need to buy. We appreciate your feedback! We’re sorry this was defective. If you have any other questions, please reach out to our Customer Solutions Team! Really good soup warmer, it’s been over 11 months already. Still working good. The temperature is good enough for maintend the heat through out the day. 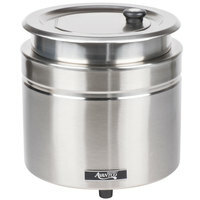 We use this Avantco Soup Kettle at our coffee and tea shop for our homemade soups. it heats up the product nicely and has a great holding temperature. We bought these for chili during our bigger tournament days. They’re much larger than we anticipated. We can fit two large size cans worth of chili in one. Great investment for our league, but we’re going to order a smaller size for the normal game schedule when we’re not as busy. We serve gumbo at our restaurant and this soup warmer is ideal for keeping it hot and ready to serve. Purchased one but thinking about purchasing another. A+++ item as described. We use these to store warm quinoa that gets put in salads and grain bowls. This is a larger-sized item so take note of the dimensions. God I love this product! I put melted queso cheese and baked beans inside for our customers to serve during our lunch and dinner rush that way I don't have to keep everything on the stove and its wonderful! Would definitely buy again. Avantco W800 11 Qt. Stainless Steel Round Countertop Food / Soup Kettle Warmer is truly a great addition, It is fast and effective. This was a great addition to our operation. A true asset. No regrets whatsoever. Great price effective kettle. We had used a large national brand in years past and had a lot of problems. This model fits ours needs well and we have used it daily for over a year with no issues. This simply looks awesome and professional. The Avantco W800 11 Qt. Stainless Steel Round Countertop Food / Soup Kettle Warmer is the perfect size for our delivery cars. Keeps items piping hot! I love this soup warmer!!! During the holidays we always have family over at our house and I usually make my famous chicken and rice soup and it is a hassle having everyone come to the stove to grab a bowl so this year I got one of these and I couldn't be happier! It keeps my soup at just the right temperature. And it is out of the way and doesn't take up that much counter-space. very pleased! We use the warmer to warm beans and typically go through a couple a year, they never seem to last long. I purchased this about six months ago and it has held up well so far. This warmer is Awesome! Great for catering and/or hot holding soups for quick service. The insert provides easy cleaning and the easy open top with ladle hole provides great containment without spillage. I would recommend highly. These warmers are an excellent buy. Just make sure that you don't burn them dry, or the filament gets damaged and it won't work nearly as well. So far so good... Seems like the Chinese brand that all the brands are carrying but webstaurant has a good price on it! I like how it comes with everything you need to hold a soup to temperature. We use this kettle warmer for soups and macaroni and cheese, it keeps the product at the perfect temperature for lunch and dinner service. Very happy with this product will and have purchased more. We use this product daily for lunch and dinner service. Works great. Soup is kept to temp and as long as it is used as directed, soup doesn't burn or separate. Worth it! We use this soup warmer in our small cafe to keep soups ready for service at correct temperature. Works great, easy cleanup inside and out. We purchased (4) Avanctco W800 11 QT. Stainless Steel Soup Kettle Warmers for our soup kitchen. They are a great quality for the price paid. One of my stand by purchases. Works very well. Draws all wattage out of a dual receptacle so as long as you have only one thing plugged into that receptacle, it is a nice piece of equipment at a fair price. We purchased this warmer for our new line of soups. It has exceeded our expectations. We initially set the temp to "4" setting and it kept the soup at a perfectly hot without scorching one's tongue temperature. I bought this to keep my chocolate tempered. it keeps the temperature perfectly once you've figured out which dial is the correct setting for you. Our warmer died after many years of operation. I needed to replace it, so I ordered this and use it for our mac and cheese. This is a good warmer. Nice size. Use it for soups and gravies. Temperature controls are around the back next to the plug, and there are no indicator lights to let you know the unit is in. But other than those minor criticisms it works well. This soup warmer is great, it maintains soup at a great temperature and it is very easy to clean. We have 3 of these already and they have lasted over 5 years of heavy use. This soup kettle warmer is very helpful specially in buffets, we like that it works great and because of it's size, it can easily be positioned just about anywhere. It is of great quality and we highly recommend it. Super kettle warmer at a discount. Avantco does it again with this stainless steel kettle warmer. Quality that matches the other name brands but at a fraction of the price. Definitely recommended. Ordered my first Avantco warmer in 2013 and worked great until it stopped working in March 2016. I ordered a replacement and very dissapointed that it stopped working today May 14, 2016. I have contact the Webstaurant about the 6 month warranty, so we will see how this is handled. Very dissapointed in the second unit. This could be a fluke, so we will see what happens with the warranty. Thank you for the review! We're so sorry to hear that the warmer was defective! We will get this resolved directly and will be sending you a new unit under warranty. The Avantco W800 11 Qt. Stainless Steel Countertop Soup Kettle Warmer - 120V, 800W is a great product. In our restaurant for heating brats. It would also make a great soup pot. Got this pot to keep chili warm all day, works great and holds a decent amount to help get through the day. Very easy to clean. Nice solid kettle warmer and way cheaper than the name brand ones. Durability is good and so far We have not had any problems nor do I foresee any. We have 3 of these in our bakery and they are perfect - nice looking, holds the soups warm all day and warms up rapidly. Easy to wipe out and clean. Great warmer for the price! Have purchased two of these for different locations... Have held up well to daily prolonged use. Definitely would recommend this product, and the price is much lower than comparable warmers. I ordered two of these without knowing what they would be like. They are great to work with and easy to clean. I then bought the smaller model since this worked so well. Great soup warmer at a fantastic price, especially considering it comes with insert. In my opinion, it has a much better design than the volrath equivalent: easier to clean since the element is below the water well, and doesn't boil water out all over your counter when you turn it up all the way. Also, doesn't need a gasket at the bottom of the well, so one less thing to go wrong. This 11 quart kettle warmer has been great, we keep our barbecue sauce warm, good construction and very good pricing. I have recommend this to other restaurants. Purchased two of these warmers in Sept. 2013. One still works great but the other has stopped keeping product warm. Was hoping to get more life out of it than this. Unfortunately there is only a six month warranty. You definitely cannot beat the value of these soup warmers. They have served me well at my cafe to heat soups up and keep them at a constant temperature. This soup warmer serves its purpose. Its easy to clean and looks nice. Its pretty big. I recommend bringing your soup to the temp you want before placing it in the warmer. It takes it a while to warm things up. It should have light indicate the power on and off that sometime not sure it still work or not? But the good side is it warm soup not over hot. We use this for chili, soup and other food items (and even as a "hot water bath" for sauces we want to keep warm!). We have used these for a long time and have never had any heating issues, etc... Great item. L'Avantco W800 11 Qt. Countertop Warmer - Fait de Stainless Steel facile à nettoyer, sa conception rencontre mes exigences, il me sert pour les sauces, j'ai tellement aimé, j'ai acheté deux du même modèle. This is probably the MOST amazing products we've purchased here. It's a good size (we can fit lots of soup in it), the stainless steel finish looks great in the shop! This is a very nice soup pot. It heat up quickly and maintains the adjustable temperature consistently. I will be ordering more for my second cafe location. This soup warmer is perfect for our bakery/café. Very easy to use and works perfectly to keep soup hot and ready to serve. Just what we needed. Fast shipping and handling. Thank you so much. We will keep your website store as our reference. First time purchasing and we are satisfied. Have a good one. So good! I keep warmed chocolate in this to quickly dip strawberries, bananas, and other items and it does an outstanding job! My last one had a tendency to burn the chocolate on the bottom but this one hasn't yet! This is a nice size warmer for my small juice shop. It keeps everything warm as it should and so far there have been no problems. They've been in service for about 2 months now. Worth the money to me for sure. Good size warmer. Soups Stews warm up great ! Time taken for the temperature to be reached is much less. Keeps food warm for a long time. We purchased 3 of these for catering and events. They heat up fast and keep the contents at the perfect temp. Very attractive to display and easy to clean. The Avantco Warmer works perfect. It is very easy to clean and keeps soups warm. The lid fits very well and allows for easy transport. These soup warmers are great! The water chamber is one complete piece so that the heating element is not exposed to water. We have switched all of our warmers over to this brand. We have been using them every day for over 1 year with no problems. A LOT cheaper than other brands earns the 5 stars. I needed a solution for my dining room to serve some hot sauces on special occasions. We use this electric warmer mostly for hot fudge on Ice Cream Sundae nights and it performs flawlessly. Easy to clean and provides a good steady heat. Absolutely the best price anywhere. No sacrifice on quality. Operated very well, keeping our product at a steady, safe temperature without altering the taste or consistency. Lightening fast delivery. Wow!! Thanks. We have a couple of these warmers and they work well. The water under the pot helps to evenly heat the contents. The stainless finish looks nice. this is realy a good food warmer. we use it for soup and it holds enough soup for the day. it looks good and for the price you can't beat it. These countertop warmers keep items piping hot for hours! They work great for making soup service go smooth during a busy dinner service! Easy to set up a separate soup station for servers!! We have two of these and they work great for dipping chocolate in our business. Customers love our strawberries now that we dip out of these. These are great. For years we have used the more expensive ones and they go out as radidly are these that do a good jog! Excellent soup solution for great low price! We have had this product for only about a month, but so far I must say it does it's job while taking up a rather small amount of space which is a big plus.